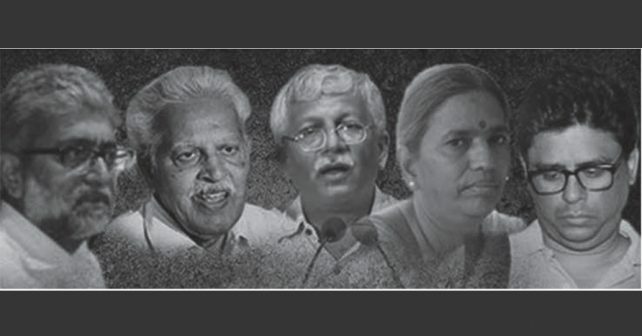 Modi government has been at pains to coin a new phrase ‘urban nexalite’ to describe the five well known social activists who have been detained by the Maharashtra police. The truth is that their activities have always been above board, and connected by one common thread. All of them have been fighting for the rights of the underprivileged and the vulnerable. For a quick look at the career of these activists. Pendyala Varavara Rao is an acclaimed Telugu writer, a poet and critic with a Marxian approach to sociology. Besides, he has been openly advocating Marxist and Maoist political philosophy right from 1960. He has served many stints in jail, five major terms and innumerable short term detentions. The first conspiracy case was slapped on him in 1974, along with a few other activists, in what was known as Secunderabad Conspiracy case. Even when the case was going on, he was slapped with Ramnagar Conspiracy case 1986. He was acquitted in both the cases, and settled down in Hyderabad, but would not be permitted a peaceful existence, being dogged and assaulted by the police as well as gangsters. He acted as a spokesman for the CPI (Marxist) to hold reconciliation talks with the Congress government in 2004, but the talks broke down in the middle. The other target of the Modi government is Sudha Bharadwaj’ a rights activist, a practising high court lawyer, and a visiting professor at National Law University, Delhi. As an activist, she works among labourers in mines and industrial plants, and fights for the rights of Dalits and tribals. She moved to Faridabad a year ago and is living at present with her daughter Anu Bharadwaj. Arun Ferreira, 48, is a familiar face, well known for his work among the marginalized sections of western Maharashtra’s remote districts. He is too mild mannered, people who are familiar with him and his work might consider, to the kind of terror operations he is accused as having carried out. Ferreira was not present at the Elgar Parished, which, the authorities think set off anti Dalit violence at Bhima Koregaon in January. He had spent five years in Nagpur Jail, having been arrested in 2007, on the strength of fabricated charges that linked him to nexalites in the region. He had given an account of the ordeal he had undergone in prison in his work, ‘Colours of the Cage’. In 2014, he was acquitted of all the 11 cases foisted on him, but he had to carry on a hectic battle for that. Ferreira, however, claimed that prison did not break him, instead it infused him with a resolve to fight for political prisoners and raise the issue of the inhuman condition of the under trials. While in prison, he acquired a law degree which has enabled to him to carry on his mission more effectively. The next one who was at the receptive end of Modi government’s ire was Vernon Gonsalves, who was arrested by Maharashtra police for nexalite activities. After spending six years in various prisons he was released for lack of evidence in all the 17 cases slapped on him. He was accused of having staked a huge amount of money in “numerous accounts”, for using towards “anti-national attacks”. Gonsalves maintained that he was totally innocent and all the cases against him were fabricated. And the prosecution miserably failed to prove even a single case against him. His arduous prison life only succeeded in hardening his resolve, and he is determined to expose the rot in the system, which task he has been carrying on with formidable fearlessness. Gonsolves, a native of Mumbai, is an academic and writer, besides being deeply involved in social issues. His wife, Susan Abraham, is a well known civil rights and labour lawyer, who earnestly takes part in issues of communalism, women’s rights or any manner of injustice. Gonsalves had been a faculty member in reputed colleges, before he chose to be a full time activist and became a writer while in prison. And recently he has penned a number of articles exposing the failure and hypocrisy of the BJP government, backed up with solid facts. The fifth one to be arrested was Gautam Navlakha, who is too far removed from the scene of action mentioned by the police to become a credible target. As a human rights activist, he has been a prolific writer on Jammu and Kashmir for three decades, exposing the atrocities of the government against peace loving local people. He advocates demilitarization of the war torn area . An editorial consultant for ‘Economic and Political Weekly’, he has worked with the International Peoples Tribunal for Human Rights and Justice in Kashmir, for compiling a report an “Alleged Perpetrators: Stories of Impunity in Jammu and Kashmir.” The report exposed excessive human rights abuses and what it called ‘hyper militarization’ in Kashmir. In fact Navlakha has been visiting Kashmir regularly since 1990 and has taken part in several campaigns that highlighted the misery of the Kashmiri people. In spite of extensive surveillance, Gautam Navlakha had been working without any break, and his work is widely known. All these have been arrested by the Pune police as conspirators against the government, on the strength of fabricated evidence. Their houses have been ransacked and the families threatened. They are falsely connected with the Elgar parishad held at Pune on 31 December 31, by more than 250 Dalit organizations. The next day was to be the 200th anniversary of the Battle of Bhima Koregaon in which a regiment of Mahars vanquished the peshwa army. This is celebrated as a significant event in Dalit history. 1st January 2018 celebration became special because it was the bicentennial celebration of the battle. When the police were trying to take them to Pune for being locked up, a three member bench of the Supreme Court, consisting of Chief Justice Dipak Misra, Justice D Y Chandrachud and AM Khanwilkar directed the police to place them under house arrest. This was in response to a petition filed by historian Romilla Thapar and four other intellectuals who were convinced that the arrested activists were being harassed as part of political vendetta by the Sangh Parivar with the police unabashedly playing second fiddle to the government’s orchestration. The police put up a forceful defence of their action, saying that they had incriminating evidence of the underground activities of the detained activists who were out to destabilise the government. They even proclaim that they have collected sufficient evidence that the arrested intellectuals had hatched a plot to assassinate the Prime Minister. But people who believe in human rights look at the other side of the story, where the Sangh Parivar is disillusioned at their inability to infuse their Hindutva agenda into the national mainstream. All their attempts to whip up pseudo national spirit with their ‘Nationalism Vs Sedition’ slogan is getting them nowhere. There is a visible rise of dalits and the marginalized, much to the discomfort of the rulers. So the BJP has a double failure staring at their face. One is their total failure to deliver the goods as a government. None of their tall promises made during the election campaign has been kept. Economy is in shambles. Their Hindutva agenda has had no buyer. None of their attempts to sow hatred between communities has born fruit. Everywhere in the country, there are people, rights activists and intellectuals, who enlighten people and keep them from being taken away by the Sangh Parivar propaganda. What will happen if the pressure valve bursts? Democracy will burst and there will be bloodbath everywhere in the country.